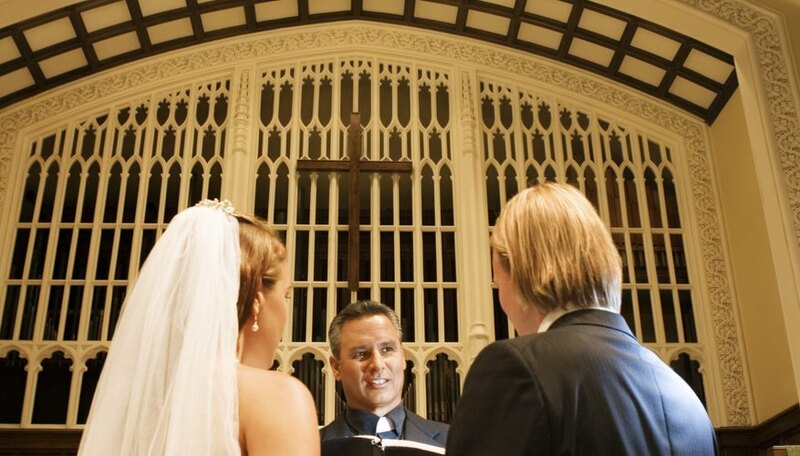 Having a wedding reception in a church reception hall may be a challenge because they can be very plain and lacking the extravagance of other wedding venues. However, if you view the space as a blank canvas rather than a simple and plain space, you can be inspired to transform the hall into the romantic wedding space of your dreams. Utilize small, personal touches to make the venue more intimate and special. A church hall can be transformed with romantic decoration details. Cover all of the tables and chairs with linens to help give the room a romantic and warm feel. Use lace for a vintage look, or bold colors, such as red, for a passionate and warm look. Mix the two by using a bold main linen, such as a red tablecloth and chair cover, with lace accents, such as a lace table runner, lace napkins and lace chair sashes. Create a dramatic ceiling to help conceal the typical, blank ceiling. Attach the ends of white Christmas lights at opposite ends of the room, so that they sink down in the middle, creating an arc effect. You could also opt to hang paper lanterns at varying heights throughout the room instead of the strands of lights. Pay special attention to the lighting of the room to create soft mood lighting that enhances the romantic appeal of the room. Hang small, electric candles from the ceiling using fishing line so it appears the candles are hovering in mid air. Hang several on the same lines, mixed with crystal beads and cluster them together in the center of the room to create the look of a chandelier. Place real candles on the tables to cast a glow onto the guests seated there. Drape fabrics to create a border along the walls and cover the walls completely. By covering up blank hall walls, you help make the space feel more intimate. Use soft fabrics such as organza or satin for a lush effect. Scatter rose petals on the centers of tables and even on the dance floor for a romantic touch. Utilize numerous floral arrangements to add a natural touch to the space. Use rose bouquets for a classically romantic display. Place them on tables and larger arrangements on the floor. Frame romantic photos of the bride and groom together and place them on accent tables, such as around the wedding cake on the wedding cake table. Barry, Michelle. "How to Make a Romantic Church Reception Hall." Dating Tips - Match.com, https://datingtips.match.com/make-romantic-church-reception-hall-12097131.html. Accessed 19 April 2019.